When alerts are configured, which raise email alerts when a significant error occurs on the Couchbase Server cluster. Full Administrators and Cluster Administrators can configure alerts. The email alert system works by sending an email directly to a configured SMTP server. Each alert email is sent to the list of configured email recipients to highlight specific issues and problems that you should be aware of and may need to check to ensure the health of your Couchbase cluster. Alerts are also provided as a popup within the Couchbase Web Console. It is important to ensure that all Couchbase Server nodes have network access to the configured SMTP server. You can define the settings using the Web Console or using the REST API. From the Couchbase Web Console > Settings > select the Email Alerts tab. 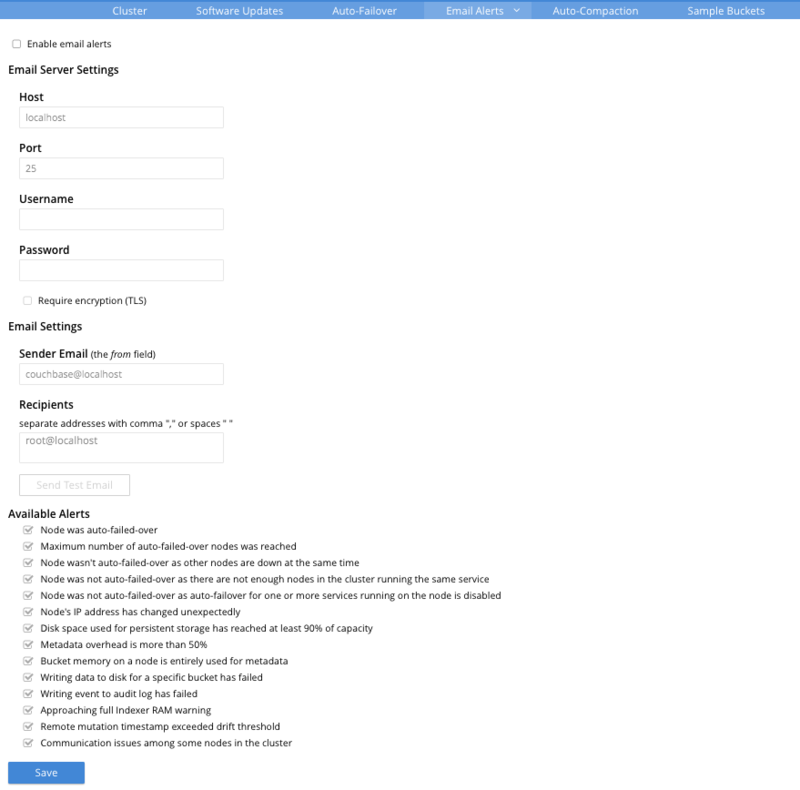 Select the Enable email alerts check box to enable the email alerts configuration. These alerts are raised for errors that you select in the Available Alerts section. The hostname of the SMTP server that will be used to send the email. The TCP/IP port to be used to communicate with the SMTP server. The default is the standard SMTP port 25. For email servers that require a username and password to send email, the username is used for authentication. For email servers that require a username and password to send email, the password is used for authentication. Note that when you save the settings you enter, the password that you typed into the Password field becomes invisible, and the field therefore appears blank. This is a security measure imposed by Couchbase Server: the password remains valid, and will be used in authenticating with the email server. Enable Transport Layer Security (TLS) when sending the email through the designated server. The email address identified as a source from which the email is sent. This email address should be one that is valid as a sender address for the SMTP server that you specify. A list of the recipients of each alert message. To specify more than one recipient, separate each address by a space, comma (,), or semicolon (;). Click Send Test Email to send a test email to confirm the settings and configuration of the email server and recipients. The sending node has been failed over automatically. The auto-failover system stops auto-failover when the maximum number of spare nodes available has been reached. Auto-failover does not take place if there is already a node down. You cannot support auto-failover with less than three nodes. Auto-failover does not take place on a node as one or more services running on the node is disabled. The IP address of the node has changed, which may indicate a network interface, operating system, or other network or system failure. The disk device configured for storage of persistent data is nearing full capacity. The amount of data required to store the metadata information for your dataset is now greater than 50% of the available RAM. All the available RAM on a node is being used to store the metadata for the objects stored. This means that there is no memory available for caching values. With no memory left for storing metadata, further requests to store data will also fail. Only applicable to buckets with Value-only ejection policy. The disk or device used for persisting data has failed to store persistent data for a bucket. The audit log event writing has failed. The indexer RAM limit threshold is approaching warning. The remote mutation timestamp exceeded drift threshold warning. There are some communication issues in some nodes within the cluster.